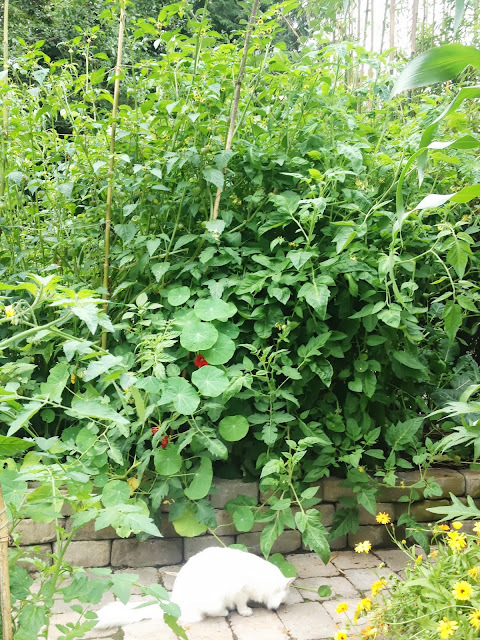 Growing Steady: It's A Tomato Year! I love growing tomatoes, and this slightly warmer-than-average Seattle summer has made growing them extremely easy. 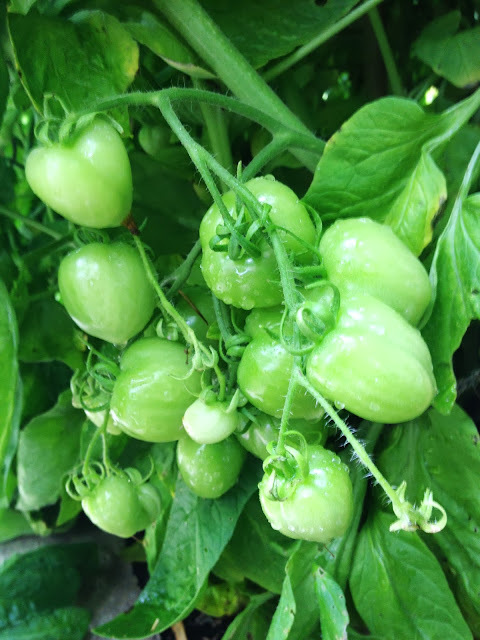 Crops related to tomatoes - potatoes, peppers and eggplants - are also fun to grow but one of the best nightshade crops for us here in the Pacific Northwest is the tomatillo. They seem to take cool conditions better than tomatoes and produce serious quantities of plum-sized fruit. They always look gross in the produce department at the grocery store but grown fresh they look and taste amazing. The tomatillo & tomato plants are requiring increasingly taller stakes! 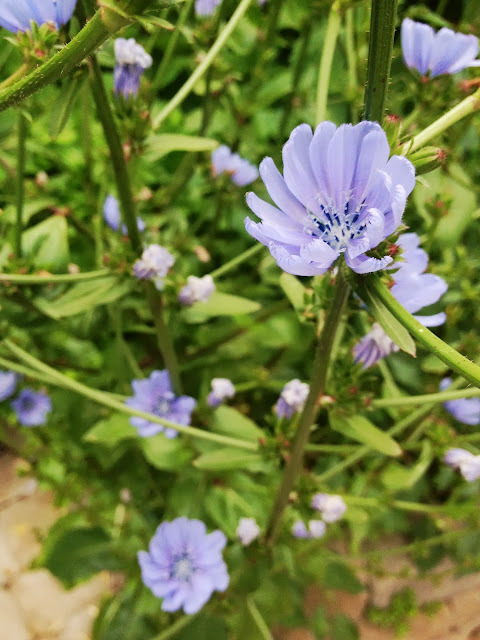 The blue-purple flowers on this lettuce (not sure the variety) are almost as eye-catching as the color of an artichoke flower. Your computer monitor (and my iphone camera) are not capable of reproducing this brilliant blue color so just use your imagination. I could always photoshop it and saturate the colors, but I'm not that kind of blogger. After having a peach tree die from peach leaf curl, I replaced it with Peach 'Frost' and have been more than pleasantly surprised. Peach 'Frost' is supposedly the most peach leaf curl resistant variety out there. It has produced heavy quantities of peaches from the first year and isn't even growing in great conditions (partial sun, partially clay soil). The best part is after three years it hasn't suffered from any significant pests or diseases. The peaches themselves are not quite as delicious as I'm capable of imagining them to be, but still well worth the effort. After removing the peas in early July, I planted some lettuce, kohlrabi, cauliflower, broccoli, and fennel to carry the harvest into the cool season. I planted this red cabbage in an area of the garden composed of entirely edible yet ornamental landscape plants. 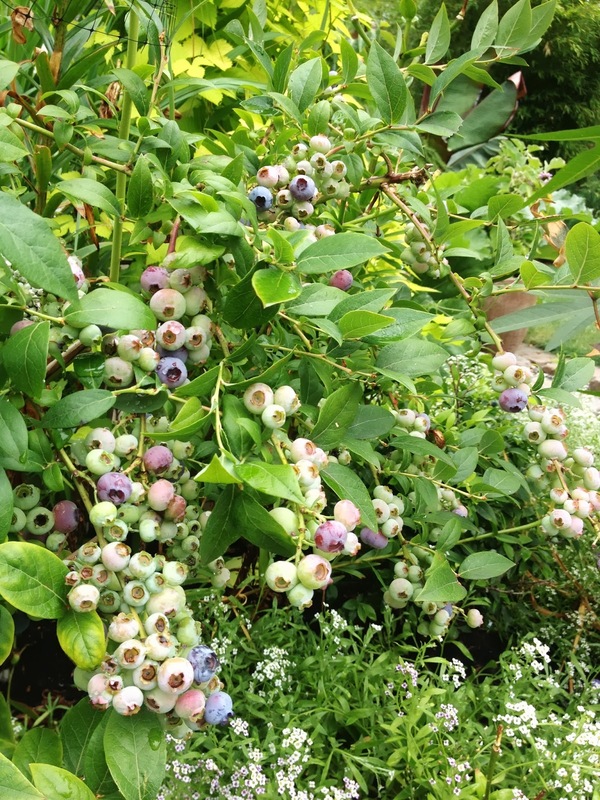 Arguably the best edible landscape plant for us in Seattle is the blueberry. Some are evergreen; the others produce brilliant fall color. I'm growing about 10 different varieties which help extend the harvest period from early July through to late September. 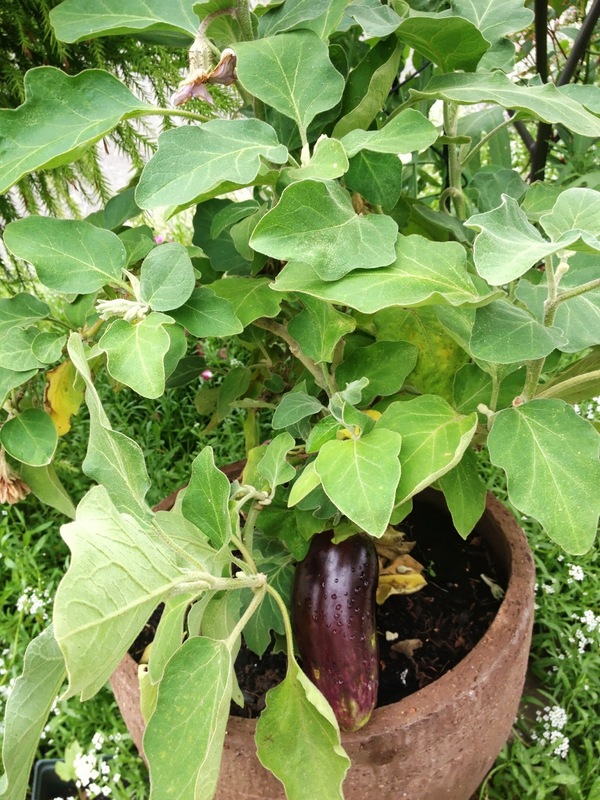 I've gotten a few small eggplants on the three eggplant plants I grew from seed last year. They are fun to grow and overwinter easy enough in the greenhouse. These lemons are just about ripe! I should be able to make about one glass of lemonade with these...but it will be the best glass of lemonade in Seattle! Are you sure those blue flowers are lettuce...they look like Chicory to me. Good call. It's definitely chicory. You grow so many great edibles Justin! I keep thinking of getting a Meyer Lemon, especially for that wonderful citrus flower fragrance. Maybe next year.